Wing Chun Boxing Bag - a boxing bag in the style of Wing Chun. Development of WDS. The bag has 3 through holes, for the installation of handles from the ash. Chains allow the construction to rotate 360 degrees. The blows on the mesh can be applied with all the power, both hands and feet. When swinging and rotating, a boxing bag strikes back, which is the most crucial in this model. The bag can be kicked at all levels, while blocking incoming shots with handles. The bag can be hung using chains, anywhere, where there is space for training, for example: on the bar, on the tree, on the ceiling, on the doorway, on the balcony ... 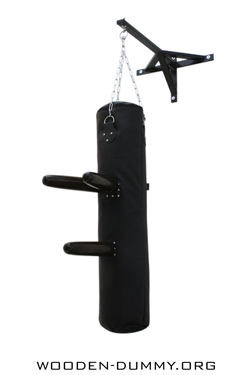 The design is easily mounted and dismounted, like any punching bag, just pull out handles and remove from the chain. Handles are fixed to 3 pegs. The bag is made of crozza, as a filler rubber crumb is used, for professional work. The jointing elements are riveted for tight fixation. It turned out a very good dummy for working out all kinds of blows from boxing, to elements of wing chun. This model is, uniquely new in the production of WDS.